Organic Movement’s 4th Annual Charity Gala Benefiting SOS Children’s Villages of Florida on August 20th, 2016. We’re proud to be the official photographers at the August 20th Organic Movement’s 4th Annual Charity Gala benefiting SOS Children’s Villages of Florida! Those who attended to support the cause enjoyed some drinks and good food, danced, participated in some Roulette, Poker, Black Jack, and much more! Organic Movement’s partnered with local boutiques and businesses to include items such as gift cards, beauty products, hair care, desserts and more… all for the benefit of SOS Children’s Villages. We at Sweet Memories Photography even contributed a cute gift basket, including a family session! Just a little information on SOS Children’s Villages – Florida: “it is a foster care neighborhood in Coconut Creek. The Village is a tree-lined, cul-de-sac of twelve houses, which are home to seventy-two boys and girls. The SOS promise of “Healing, Hope and Home for Every Child” assures every child growing up in the Village a safe and secure home, a nurturing family, a vibrant childhood and array of services to help them overcome their past traumas and build a successful future. All profits from this event helped SOS provide basic needs, childhood activities and vital services like therapy, tutoring and life skills for the 75 children who call the Village home. 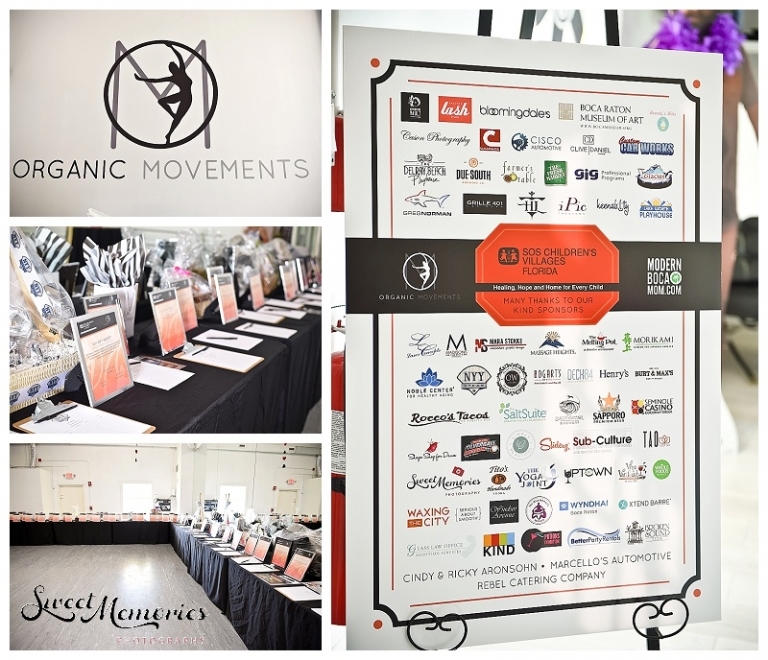 Thank you to all of the amazing guests, donors, and sponsors for supporting Organic Movement’s 4th Annual Charity Gala benefiting SOS Children’s Villages- FL! All of the generous donations for the silent auction. A special ‘thank you’ to A Casino Events for their wonderful contribution! How delicious do these look?! Rebel Catering Company did a phenomenal job … I could eat their food all day, every day!